One of the most enduring symbols of space exploration is a planet surrounded by a ring. This symbol inspires a celestial context: nothing on Earth is like it! What a wonderful surprise that the ringed planets are just as beautiful and scientifically compelling seen close-up. We now know that planetary rings, once thought unique to the planet Saturn, exist around all the giant planets. 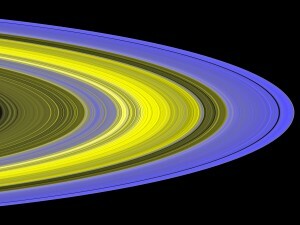 These rings are not solid objects, but composed of countless particles with sizes from specks of dust to small moons. All rings lie predominantly within their planet’s Roche limit, where tidal forces would destroy a self-gravitating fluid body. They are also within the planet’s magnetosphere, and in the case of Uranus, they are within the upper reaches of the planetary atmosphere. For each planet, the rings are quite different. Jupiter’s ring is thin and composed of dust-like small particles. Saturn’s rings are broad, bright, and opaque. Uranus has narrow, dark rings among broad lanes of dust that are invisible from Earth. Neptune’s rings include incomplete arcs restricted to a small range of their circumference. The ringed planets are not just objects of beauty, but complicated physical systems that provide a local laboratory and analogy for other cosmic systems like galaxies and planet-forming disks. The common occurrence of ring material around the planets is one of the major scientific findings of the last 25 years. The new ring systems were discovered by both spacecraft and ground-based observers, often surprising us by contradicting our expectations. The rings’ appearance and their composition vary among the planets, and likewise within each ring system. The broadest set of rings and the most identified processes are found around the planet Saturn, which is the target of the US/European Cassini space mission. LASP continues to study Saturn’s rings with its Ultraviolet Imaging Spectrograph (UVIS), which will continue operating throughout Cassini’s extended “Solstice Mission,” ending in 2017. This also involves theoretical modeling and numerical simulation of the ring evolution. To date, UVIS occultation studies have determined the structure, composition, and history of the rings.